George Graham Reviews Kelly Carmichael's "Queen Fareena"
The blues revival shows no signs of diminishing, but most performers on the scene these days tend to hew to a few specific varieties, such as Chicago style electric blues, the Memphis style, as well as well as the acoustic rural blues. This week we have a new recording by a gentleman who draws on a kind of string-band and novelty blues style that existed in the early part of the 20th Century. He is Kelly Carmichael, and his new CD is called Queen Fareena. Kelly Carmichael has a somewhat unlikely background for the music he plays. He was born some 41 years ago in Murphreesboro, Tennessee, but grew up in Stone Mountain, Georgia. His main musical exposure as a youth was this father's Fifties rock and roll records. He started attracting attention playing guitar in a couple of heavy metal bands, Internal Void and Pentagram USA. But in the early 1908s, he discovered the blues after he moved to Fredricksburg, Maryland, where he heard some Robert Johnson records, and he was hooked. He took up a variety of instruments appropriate for the style including a six-string banjo, some xylophone, plus conventional and resonator acoustic guitars. On his new second solo blues CD, he is joined by a band that evokes the sound of old novelty recordings, and shows a good deal of New Orleans influence at times. They include a couple of horns, fiddle and accordion, as well as acoustic bass and drum set, and they arrange themselves into various combinations on the tracks. The material is mostly traditional tunes, or songs by known composers such as Rev. Gary Davis and Mississippi John Hurt, that they are old enough be be thought of as traditional. Everyone sounds as if they are having a good time, and in the process, they sound rather authentic, despite the occasional quirky combination of instrumentation. But it's a fun record througout. 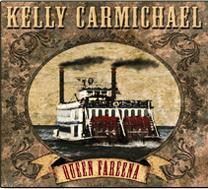 Kelly Carmichael's new CD Queen Fareena is an enjoyable album that spotlights a facet of the blues that one does not hear that often these days, even in the midst of a blues revival. A few other contemporary performers have ventured into old-time blues with string-band influences such as Steve James and Bob Brozman, and John Hammond has been doing it for decades, as has Ry Cooder, when he wants to. Carmichael and company make music that sounds authentic, even if their combination of styles and influences might not be entirely the way it used to be. The group adds some first-rate musicianship, and their enthusiasm is palpable, adding more to the good-time feeling of the recording. Our grade for sound quality is about an B plus. The recording has a kind of old-fashioned sound, but the studio effects fontunately don't extend to imitating the low-fi sound of a wind-up phonograph. But there is a lot of compression to that mashes just everything into about the same volume, and the sound could be cleaner. To qualify and paraphrase the saying "Everything old is new again," The blues in the old style that Kelly Carmichael does on his new CD, old as it is in its influences, makes for a fun and rather novel sound in this day and age.